Great running from everyone from the Spring 5 and the varied races over the Chocolate break and Helsby has definitely had a rebirth over the last year. Many thanks to Colin Thompson once again for ensuring we have a set of results out this week. Firstly i’d like to draw everyone’s attention to an article in the Chester Chronicle about Helsby runner Paul Bulmer that Jackie has informed me about. It’s an inspiring read and goes to show what can be achieved and also how people should regard the club as a team however well we do individually. On Wednesday 16th April it was the Chester Spring 5 and 3rd road counter in the Helsby summer series which saw 17 green vests out in the country lanes of Upton. Colin Thompson for full Helsby points in a very good field was an impressive 18th in 28.26 while Joanne Lacking keeps her great form for first in for Helsby ladies to take the honours. Well done to everyone else who secured PB’s as I know Tom did. Well done to all who ran. On Good Friday it was the Salford 10k with the very Good Ivan and Dave putting Helsby on the map in Manchester. (Was Moyes running the other way?) Ivan’s race report below. Myself and David madders ran the Salford 10k on Good Friday. This event is a two lap course starting from Salford sports village. Not the prettiest of courses but quite flat and a good for those pb hunting. For some reason I thought this might be one of those “niche” events that slip under the radar from time to time, where a 40 minute 10k might just put you well up the final placings…how wrong I was. A quick look at the results will show what a quality field turned out for this; 10 people ran under 31 minutes and a sub 35 only just got you in the top 50. Despite this, the weather was kind and although they went to great lengths to give us all chip (timing), there didn’t seem to be any timing mats on the course and the results seem to be gun times only? So chip times probably a Few seconds faster. That third place team place is fantastic news! Well done guys. Thanks also to everyone out watching and supporting the race. It’s much appreciated by all the runners and please let me know if you have supported and watched a race because it’s nice to give a thankyou to those who dedicate a lot of their time to the club. On Friday 25th April (this coming Friday) a few of us are going to the Chinese Delight in Frodsham for a meal, and then in to Frodsham for a drink or 12. I have 14 confirmed names on Facebook already but if you would like to come and your name is not below please email me on lspruce83@live.co.uk so I can add you to the list. Unfortunately as it is quite short notice I need numbers by Wednesday 23rd, sorry it’s last minute but hopefully some of you can make it. It was a busy weekend running wise with a fabulous Helsby turnout at the latest Delamere Park Run 5k on Saturday 12th April. Twelve green vests were led home by the brilliant Colin Bishop who ran through the finishing tape for first overall with Colin Thompson running well with a solid 4th place. Tom Dejong took his course PB and Janet Robertson led the ladies home for 56th overall. Well done to all who ran. As I’m sure many of you are aware it was London marathon weekend last Sunday and many of us were tuned in, not to watch Mo but to see how our three Helsby runners got along. Not far behind Mo in all fairness was Chris Fitzpatrick with an awe inspiring sub three hour run to finish in the top 1000 of the race. Guess he never wore the mankini in the end. Great and similar runs were had by Helen Owens and Clare Miller. Helen Owens had completed a sub four hour Manchester Marathon just the week before too. Very impressive Helsby quartet there and be sure to congratulate them. Hope I’ve not missed anyone, let me know if so! It was the 2nd road counter of the Helsby summer road series on Sunday at the local Whitley 10k, a race organised by Spectrum which takes in some of the country lanes of Cheshire and the pleasant village of Whitley. Another great turn-out for Helsby with a good battle for club honours between the many categories. Ivan Davies piloted the way for Helsby with a great win closely followed by Roy and Ian. Louise McEveley was first lady home to take the full race points. Hopefully this now makes it interesting for the third road counter this coming Wednesday at the always popular West Cheshire Spring 5 race. In other news did anyone find a blue OMM jacket last Wednesday after the club talk as it was possibly left on the night by a club member? If so please drop me a line. Could someone also ask behind the bar tonight too. Just to reiterate, it’s a blue OMM jacket, very lightweight. Good luck to all those at the Spring 5 on Wednesday and hopefully our marathon runners are also recovering well. Many thanks to Colin Thompson for his round-up last week! The Delamere Park Run 5k this Saturday 5th April saw two vests out for Helsby with first in Gareth Boyd in 11th overall followed by Louise McEveley in 60th. Well done to Gareth and Louise who were also out at the Border League race the following day. Full results below. It was also the monthly Halewood 5k on Saturday morning with Colin and Tom in fine form to secure PB’s or equal too’s! Colin was first in and a fine performance too considering the Borders the following day. Colin ran for a top ten position and Tom DeJong with a superb sub 20, something he has been aiming for recently, showing his progress and commitment to running. Well done to both and be sure to congratulate Tom on his milestone performance. Sunday 6th April saw the illustrious Manchester Marathon with some very impressive performances from the six Helsby runners on the day led home by Joanne Lacking in a quality 3 and a half hours and Dave Feakes well under the four hour mark. 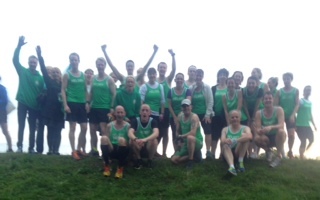 It was the Border league Race 6 at New Brighton also on Sunday with 17 runners out for Helsby so a very good showing for the green vest. Thanks to all supporters on the day as it really helps the runners and provides that little extra incentive. Great times and positions from the two Colin’s and six Helsby men in the top 100 now shows the strength in depth at the club. The ladies still continue to shine and to have two teams out as Joe stated earlier is fantastic for the club. No team results as looks like an incorrect link currently on the website below. Away from the roads now and a visit to the Lakes by Tim and Jenny on Sunday saw them at the Grizedale Forest Trail Race. Promising performances by Tim and Jenny show even brighter times are ahead for Helsby on the fells this year! Tim’s race report below. Great running once again Helsby!